Alan Deere was born in Westport, New Zealand, on 12th December, 1917. 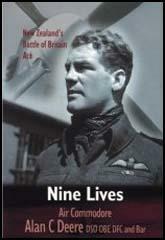 He joined the Royal Air Force in October 1937 and was posted to 54 Squadron in September 1938. Deere was based at Hornchurch during the Dunkirk evacuation and during a four day period (23rd to 29th May) he shot down three Messerschmitt Bf109 and three Messerschmitt 110. This resulted in him being awarded the Distinguished Flying Cross (DFC). During the Battle of Britain Deere destroyed seven more enemy fighters and one bomber and was awarded and was awarded a Bar to his DFC. Later he was to win the Croix de Guerre. In January 1941 Deere became Operations Room Controller but returned to action in May when he joined 602 Squadron as a Flight Commander. Deere, who published his autobiography, Nine Lives in 1959. Alan Deere retired from the Royal Air Force in December 1977 with the rank of Air Commodore. (1) After being involved in a dogfight with a German pilot Alan Deere wrote a report on the relative merits of the Spitfire, Hawker Hurricane, and Messerschmitt Bf109. The great Dunkirk evacuation started on 26th May. The RAF was extremely active throughout the famous withdrawal but such is the nature of aerial combat that the skirmishes seldom occurred in sight of the actual evacuation beaches. In the thick of it at this time was Al Deere - destined to be shot down seven times and survive the war with a magnificent record. Like most others, this great fighter pilot from New Zealand had sat in a Spitfire for the first time earlier in 1940 and said: "A Spitfire is the most beautiful and easy aircraft to fly and has no tricks or peculiarities normally attributable to high-speed fighters. He was shot down twice in two days at Dunkirk. Typically, he said the first time gave him "little trouble". The second must be recorded. During a patrol over the evacuation beaches his Spitfire was hit in the glycol tank. This was always fatal to the aeroplane since the coolant drained and the engine overheated and seized in a matter of seconds rather than minutes. Al Deere crash-landed his Spitfire on the beach knocking himself out in the process. When he came round a minute or two later, he was aware of the engine smoking menacingly. Urgently, he ripped off his straps, leapt out of the cockpit, and sat down on the beach. At the moment he could only curse his bad luck rather than appreciate his good luck at being alive. Savagely I hauled my reluctant Spitfire around to meet this new attack and the next moment I was engulfed in enemy fighters-above, below and on both sides, they crowded in on my section. Ahead and above, I caught a glimpse of a FW 190 as it poured cannon shells into the belly of an unsuspecting Spitfire. For a brief second the Spitfire seemed to stop in mid-air, and the next instant it folded inwards and broke in two, the two pieces plummeting earthwards; a terrifying demonstration of the punch of the FW 190s, four cannons and two machine-guns. I twisted and turned my aircraft in an endeavour to avoid being jumped and at the same time to get myself into a favourable position for attack. 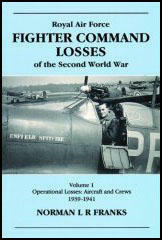 Never had I seen the Huns stay and fight it out as these Focke-Wulf pilots were doing. In Messerschmitt 109s the Hun tactics had always followed the same pattern-a quick pass and away, sound tactics against Spitfires with their superior turning circle. Not so these FW 190 pilots, they were full of confidence. "Break right, Red One; I'll get him." As I broke, I saw Murphy pull up after a FW 190 as it veered away from me, thwarted in its attack by his prompt action. My ammunition expended, I sought a means of retreat from a sky still generously sprinkled with hostile enemy fighters, but no Spitfires that I could see. In a series of turns and dives I made my way out until I was clear of the coast, and diving full throttle I headed for home.